In order to support the information needs of health care providers, researchers, policy makers involved in delivering and improving health services, and the general community, this resource guide was developed through a partnership between Dalhousie University Libraries and Nova Scotia Health Authority Library Services. The focus of this Guide is on reliable information pertaining to cannabis use and health. It is not possible to cover all relevant topics on the Guide in depth. If you are looking for more information, please contact us and we will be happy to help. We acknowledge that legalization of cannabis has health and social impacts. When experiencing these impacts, it is important to consider that the body of scientific evidence about the use of cannabis has been impacted by its status as illegal. A large proportion of the scientific evidence to date examines the potential harm cannabis may cause (e.g. Eggertson, 2017). This guide recognizes that while there is a place for harm-focused research, there is also a need to explore the therapeutic role of cannabis and anticipates that research with this focus will increase over time. This guide does not differentiate between medicinal or recreational cannabis use. 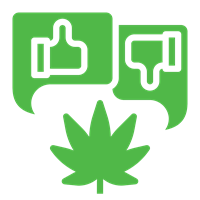 For guidance on cannabis use in your context, please consult federal/provincial/municipal laws, credentialing bodies, professional associations, employers, health care providers etc. as appropriate. Eggertson, L. (2017). The challenges of medical cannabis research. Canadian Nurse. January/February. Retrieved from https://www.canadian-nurse.com/articles/issues/2017/january-february-2017/the-challenges-of-medical-cannabis-research. This guide includes resources from Dalhousie and NSHA Libraries, as well as links to publicly available resources. Print resources from academic libraries (records in Novanet) can be borrowed by anyone through the NS Borrow Anywhere Return Anywhere (BARA) program. Access to online resources may be limited to people affiliated with particular institutions, as indicated in the listing in this guide. Recreational use of cannabis is no longer against the Criminal Code of Canada as of October 17, 2018. The chemical delta-9-tetrahydrocannabinol (THC) is the ingredient in cannabis that impacts your body. 72% of cannabis users got cannabis products from a single source, usually someone they know. Over half of the respondents reported that their supply source would change post-legalization. A compound that is either extracted from cannabis sativa (marijuana) or synthesized to elicit similar pharmacologic effects. A species of annual herb native to Central and South Asia, whose tough fiber (hemp) is used for making rope and its oils, resins, and seeds used medicinally and as a psychoactive, recreational drug. Anxiety, insomnia, irritability, and craving for marijuana (Cannabis sativa) in those who use the drug habitually and then abruptly stop using it. A more or less purified, gummy extract prepared from the flowers, stalks, and leaves of the hemp plant Cannabis sativa. It is smoked or chewed for its euphoric effects. Its psychoactive effects are usually stronger than those of marijuana. The dried flowering tops of Cannabis sativa, the hemp plant. Marijuana has many colloquial and street names, e.g., dope, ganja, Mary Jane, pot, and weed. Legally sanctioned use of marijuana for people with a variety of conditions, including chronic pain, glaucoma, or nausea and vomiting caused by chemotherapy. Pediatric exposure to marijuana or its constituent chemicals may have adverse effects on the developing brain. The principal psychoactive component in marijuana and hashish. Taber’s cyclopedic medical dictionary. 23rd ed. Phildelphia: F.A. David Company; 2017. Cannabinoid; p. 363. Taber’s cyclopedic medical dictionary. 23rd ed. Phildelphia: F.A. David Company; 2017. Cannabis Sativa; p. 363. Taber’s cyclopedic medical dictionary. 23rd ed. Phildelphia: F.A. David Company; 2017. Cannabis withdrawal symptom; p. 363. Taber’s cyclopedic medical dictionary. 23rd ed. Phildelphia: F.A. David Company; 2017. Hashish; p. 1066. Taber’s cyclopedic medical dictionary. 23rd ed. Phildelphia: F.A. David Company; 2017. Marijuana; p. 1459. Taber’s cyclopedic medical dictionary. 23rd ed. Phildelphia: F.A. David Company; 2017. Medical Marijuana; p. 1460. Taber’s cyclopedic medical dictionary. 23rd ed. Phildelphia: F.A. David Company; 2017. Tetrahydrocannabinol; p. 2328. An oil, in liquid form at room temperature of 22 ± 2°C, that contains cannabis in its natural form. A plant that belongs to the genus Cannabis. Cannabis that is or was sold, produced or distributed by a person prohibited from doing so under this Act or any provincial Act or that was imported by a person prohibited from doing so under this Act. (b) for the purposes of any other provision of this act, an individual who is under 18 years of age. Cannabis Act, SC 2018, c 15, s 2.